Almost a year ago, in our paper A New Volatility Regime, we drew attention to a new environment that we were seeing for equities. One with more volatility and more bear market phases. We also highlighted the decreasing number of good quality stocks in the US on the back of rising interest rates and their impact on already highly leveraged companies. Today, despite a more dovish tone coming from the US Federal Reserve, we are approaching the end of the economic cycle and this is leading to a revision of earnings growth. This is also likely to bring to light the high level of leverage characterising the US market. Against such a backdrop, we believe it is time for investors to focus on quality. The S&P 500 index has delivered very strong performance since the Global Financial Crisis (GFC): over the last 10 years, it has returned almost 14% per annum. 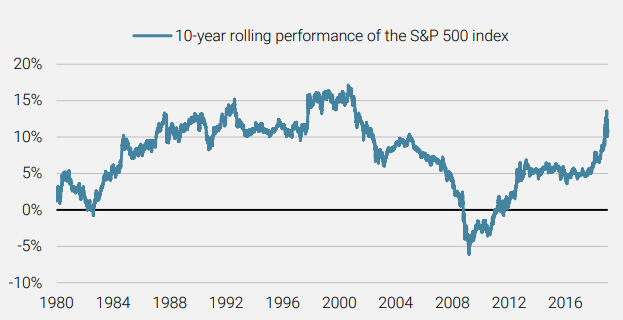 As Figure 1 highlights, the 10-year rolling annual performance of the S&P 500 index is now back toward extreme levels. Source: Bloomberg, Unigestion. Data as at 31.12.2018. This gives us a clue as to how long (and strong) the cycle has been so far. While corporate margins were supported by the lower interest rate environment and the recent fiscal stimulus measures, indebtedness has reached extraordinary levels, especially within the US small- and mid-cap universe, as shown in Figure 2. The levels of these metrics are clearly ringing alarm bells about the sustainability of the US equity market’s strength. The erosion of margins, combined with the strong levels of leverage, could lead to repayment issues and, at worst, trigger defaults and bankruptcies. More generally, another way to understand the situation in terms of leverage is to have a look at outstanding corporate debt as a percentage of GDP, which is fast approaching worrying levels. Alarm bells are ringing as to the sustainability of the US equity market’s strength. Sources: Bloomberg, Unigestion. Data as at 30.09.2018. In our opinion, investors need to be cautious about the ballooning levels of US corporate debt and target quality companies that are characterised by their strong balance sheets. Markets may have forgotten, but we remember that it is risky to consider financial products, or even individual companies, without having a clear view on what’s on the inside and understanding the underlying mechanisms. During the subprime crisis, for example, many mortgage-backed securities contained overlooked loans with embedded risks that credit ratings or market values failed to capture. Investors often focus on valuation, earnings and income statements instead of considering the overall outlook for the company (including profitability, the ability to repay debt, etc.). However, events can then occur which could lead to dividend cuts, providing a stark reminder to investors about the hierarchy of payments when there is trouble. It is risky to consider financial products without having a clear view on what’s on the inside. A dividend cut is quite rare as it sends a very negative signal to investors, hence the danger of such announcements. It is not always an indication of an immediate bankruptcy, but often signals the prompt need for cash to face debt payments. Many corporate bonds will mature in the next five years and we believe that huge amounts of debt, due at a time when profit margins are likely to shrink, will pose a significant risk. We believe these repayments will have a significant impact and the consequent erosion of profit margins will push many companies to review their dividend policy or, in worst case scenarios, will put them in a position where they are unable to repay their bonds at maturity, triggering downgrades of their credit scores/ratings. Corporate debt levels and an erosion in profit margins are likely to impact dividends. The current risk of company defaults is often measured by the high yield default rate, which is unsurprisingly correlated (with a lag) to the level of corporate debt, as Figure 5 demonstrates. Source: Moody’s Analytics. Data as at 30.09.2018. In our opinion, the dangers of default spread beyond the high yield universe. The final point made above is of significant concern given the fact that the proportion of BBB-rated companies has increased significantly since the last GFC, as shown in Figure 6. Source: Bloomberg, HSBC. Data as at 31.12.2018. We believe it is time for equity investors to ensure they are exposed to quality stocks that can provide capital protection during challenging markets. As we mentioned a year ago in our paper A New Volatility Regime, any defensive allocation should be made at a reasonable leverage, but quality should also come at a reasonable price too. It is important to remember that current levels of outstanding corporate debt are highly elevated, as illustrated by Figure 5 above, and position accordingly. And, with the US market looking very expensive, investors need to take action sooner rather than later. 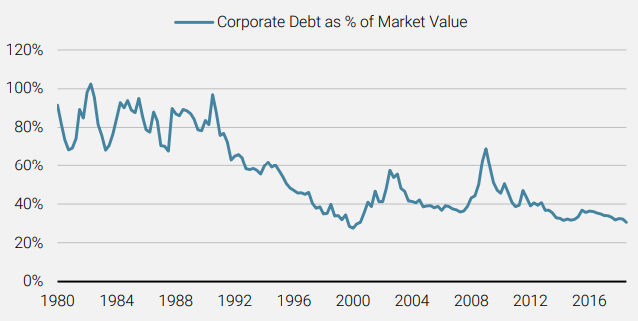 In fact, it could be argued that market valuations are as scary as the levels of corporate debt. An exposure to quality should provide capital protection during challenging markets. Source: Federal Reserve Bank of St Louis. Data as at 30.06.2018. In our opinion, the US market’s impressive rally could well end soon, triggered by the unmanageable levels of corporate debt. Any investor who is concerned about a potential market correction should be looking to minimise risk. Quality companies with strong balance sheets and attractive valuations could be the last ones standing when the market correction hits. This document is provided to you on a confidential basis and must not be distributed, published, reproduced or disclosed, in whole or part, to any other person. The information and data presented in this document may discuss general market activity or industry trends but is not intended to be relied upon as a forecast, research or investment advice. It is not a financial promotion and represents no offer, solicitation or recommendation of any kind, to invest in the strategies or in the investment vehicles it refers to. Some of the investment strategies described or alluded to herein may be construed as high risk and not readily realisable investments, which may experience substantial and sudden losses including total loss of investment. The investment views, economic and market opinions or analysis expressed in this document present Unigestion’s judgement as at the date of publication without regard to the date on which you may access the information. There is no guarantee that these views and opinions expressed will be correct nor do they purport to be a complete description of the securities, markets and developments referred to in it. All information provided here is subject to change without notice. To the extent that this report contains statements about the future, such statements are forward-looking and subject to a number of risks and uncertainties, including, but not limited to, the impact of competitive products, market acceptance risks and other risks. Unigestion SA is regulated by the Swiss Financial Market Supervisory Authority (FINMA). Unigestion (UK) Ltd is authorised and regulated by the Financial Conduct Authority (FCA) and SEC registered. Unigestion Asset Management (France) SA is regulated by the “Autorité des Marchés Financiers” (AMF). Unigestion (Luxembourg) SA is an Alternative Investment Fund Manager authorised by the Commission de Surveillance du Secteur Financier (CSSF) under the Luxembourg law of 12 July 2013 on AIFM. Unigestion Asset Management (Canada) Inc., with offices in Toronto and Montreal, is regulated in Canada by the securities regulatory authorities in Ontario, Quebec; Alberta, Manitoba, Saskatchewan, Nova Scotia, New Brunswick and British Columbia. Its principal regulator is the Ontario Securities Commission. Unigestion Asia Pte Ltd is regulated in Singapore by the MAS, as Capital Market Services (CMS) license holder and Exempt Financial Adviser under the Securities and Futures Act and Financial Advisers Act.